On May 14, 1864 a meteor shower fell in southern France, near the town of Peillerot. The meteorites, which were composed of carbonaceous chondrite, were given the name 'Orgueil.' Samples of the meteor shower were collected and sent to the Musée d'Histoire Naturelle in Montauban, France. From there the meteorites were disseminated to other museums throughout Europe, but two of the meteorites remained in Montauban, where they were sealed inside a glass jar. 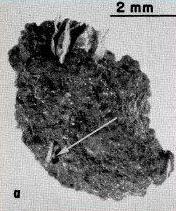 Electron microscope photo of a possible microfossil contained in the Orgueil meteorite, discovered by VanLandingham and Tan in 1966. The Orgueil meteorites remained all but forgotten until the early 1960s, when researcher Bart Nagy examined samples of them and found curious microscopic patterns that resembled lifelike fossils. He published his work in Nature, touching off a debate that continues to this day concerning whether any meteorites contain evidence of fossilized microscopic life. Nagy's work inspired other researchers to look more closely at other samples of Orgueil, and when they did, they found something even more remarkable. A team of Chicago researchers found plant fragments (entire seeds) and coal embedded deep inside one of the meteorites that had been sealed inside a glass jar and stored in the museum at Montauban. The researchers immediately suspected the plant and coal fragments had somehow gotten attached to the meteorite and were not actually a true part of it. But x-ray analysis ruled this suspicion out. The plant fragments were definitely embedded in the substance of the meteorite itself. Furthermore, the entire meteorite was covered in a glassy fusion layer created by the heat of passing through the atmosphere. Plant seeds should not have been able to penetrate this layer. This raised the intriguing possibility that the plant seeds were an extraterrestrial life form. The researchers soon ruled out the possibility that the plant seeds were extraterrestrial when they identified them as belonging to a rush indigenous to southern France. This left only one explanation for how the seeds had gotten inside the meteorite: human intervention. Orgueil grows extremely soft and clay-like when it comes into contact with water. Therefore, the researchers theorized that if someone had wet the rock, they could have then inserted the plant fragments inside of it, where they would have remained once the meteorite had dried. There was one problem with this hypothesis. If the meteorite had been soaked, manipulated, and then dried, why did it still have a glassy fusion layer? This question was answered when further tests on the rock revealed that this fusion layer was actually dried glue. They found pieces of the original fusion layer jammed within the meteorite. It became obvious that around 1864, before the meteorite had been sealed inside the glass jar, someone had gone to great pains first to embed plant and coal fragments inside of it, and then to coat it with glue to make it appear to have a fusion crust once again. Why had someone gone to such pains to tamper with the meteorite? The answer was not clear, but the researchers suggested that the historical context of scientific debate in France in 1864 could offer an explanation. In 1864 a major focus of scientific debate concerned the possibility of spontaneous generation. This was the idea that life can spontaneously come into existence inside of inanimate substances. On April 7, 1864 Louis Pasteur delivered a famous lecture at the Sorbonne debunking this concept. On May 31, shortly after this lecture, another French scientist, Cloëz, examined samples of the Orgueil meteor shower and detected in it the presence of materials resembling humic acid. He suggested that this implied the existence of life on the meteorite's parent body. It could be that someone decided to play a joke on the French scientists by placing plant and coal fragments inside of the meteorite, hoping the fragments would soon be found and interpreted as evidence of spontaneous generation within the meteorite. If this is the case, then the carefully planned hoax backfired, because the meteorite was sealed inside a glass jar and forgotten until 1962, almost a century later. Even though one of the Orgueil meteorites had obviously been tampered with, the researchers stressed that this did not have any bearing on whether the other Orgueil meteorites contained microfossils. That debate continues to this day. Edward Anders, Eugene R. DuFresne,Ryoichi Hayatsu, Albert Cavaille, Ann DuFresne, and Frank W. Fitch. "Contaminated Meteorite," Science, New Series, Volume 146, Issue 3648 (Nov.27, 1964), 1157-1161.